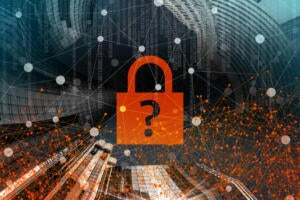 With the failures of Lehman Brothers, Fannie Mae and Freddie Mac this month, reams of Wall Street IT executives are out of work or soon will be. While financial services CIOs and their staff polish their resumes and ponder what's left of their retirement savings, we thought it might be interesting to look at how much money their bosses made last year. Read on to find out what 9 Wall Street chiefs cost their companies in 2007, once their salaries, bonuses, stock awards and more are added together. Former AIG CEO Martin Sullivan netted more than $14 million last year, including a $1 million salary, $3.6 million bonus, $921,876 in stock awards and $2.4 million in option awards. As generous as this sounds, it was actually a bad year for Sullivan, who earned more than $21 million in 2006. But don't worry too much about Sullivan, who was replaced by Robert Willumstad in June 2008. A new executive severance plan announced in March keeps Sullivan covered with salary and bonuses for 30 months after termination. AIG's 2007 fiscal year ended on December 31. Bear Stearns' former CEO James Cayne raked in $38.3 million in 2007, including a $250,000 salary, $17 million bonus, $14.8 million in stock awards and $6.2 million in "other compensation." Cayne was outsed as CEO in January 2008, when Alan Schwarz, formerly the president, took over. Schwartz sold the company to JPMorgan Chase in March, after it became clear that the investment bank couldn't survive the ongoing mortgage crisis. 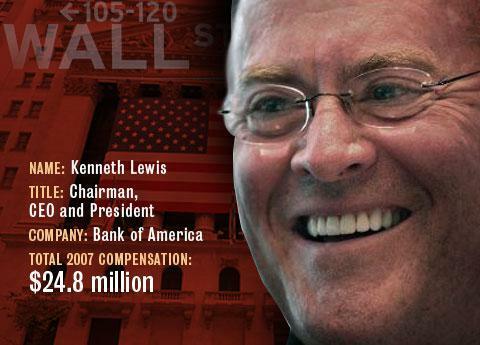 CEO Kenneth Lewis, who earned more than $24 million last year. Lewis led Bank of America to buy Merrill Lynch this week after acquiring Countrywide Financial in January. Last year, Lewis earned $1.5 million in salary, $11 million in stock awards, $4.5 million in options and $4.3 million in non-equity incentive plan compensation. His pension earned another $3.2 million, and he got more than $200,000 in other compensation. Meanwhile, industry analysts anticipate thousands of layoffs stemming from the recent Bank of America acquisitions. Former Fannie Mae CEO Daniel Mudd garnered $11.6 million in total compensation in 2007. He started with a salary of $986,923 and saw a big increase with stock awards of $6.8 million. Mudd also earned $576,492 in option awards, $2.2 million in non-equity incentive plan compensation, and $863,749 due to changes in pension value and nonqualified deferred compensation earnings. Earlier this month, the Federal Housing Finance Agency named Herbert Allison the new CEO of Fannie Mae as part of the government's takeover of it and fellow mortgage financing agency Freddie Mac. Former Freddie Mac CEO Richard Syron earned a $1.2 million salary along with a $3.5 million bonus, $8.7 million in stock awards, $3.5 million in option awards and $734,063 due to changes in pension value and nonqualified deferred compensation earnings. Other compensation worth $771,585 brought his total 2007 compensation to $18.3 million. Freddie Mac's fiscal year ended December 31, 2007. This month the Federal Housing Finance Agency placed Freddie Mac into conservatorship and appointed David Moffett as CEO. Lloyd Blankfein has the dubious honor of earning the highest compensation on our list -- totaling $68.5 million. 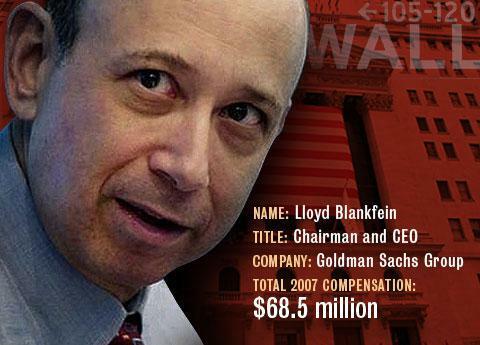 Blankfein earned a salary of $600,000, a bonus of nearly $27 million and stock awards worth another $26 million. His other stock option awards were worth $16.4 million, and he had additional compensation of $384,157. Initially, Blankfein's total compensation was $70.3 million, but that figure was adjusted down by the Board of Directors' Compensation Committee to $68.5 million. Amazingly, Blankfein wasn't the only Goldman Sachs executive to earn more than $50 million. The company's two co-presidents and chief operating officers -- Gary Cohn and Jon Winkelreid -- each earned $67.5 million, and CFO David Viniar earned $57.5 million. Lehman Brothers lost hope of being bailed out and filed for bankruptcy this week. CEO Richard Fuld, who joined the 158-year-old company in 1969, is now charged with selling off key business units. In the company's last full fiscal year, Fuld accumulated $34.4 million in compensation. He started with a salary of $750,000 and got a big boost from stock awards ($27 million). Option awards ($2.2 million) and non-equity incentive plan compensation ($4.3 million) helped Fuld hit his $34.4 million total. 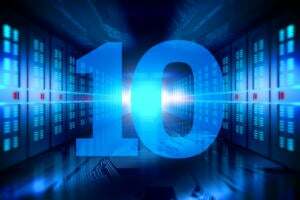 Lehman Brothers' fiscal year ended November 30, 2007. John Thain hadn't been with Merrill Lynch & Co. for a full year before this week's drama, which has the world's largest brokerage agreeing to be bought by Bank of America. 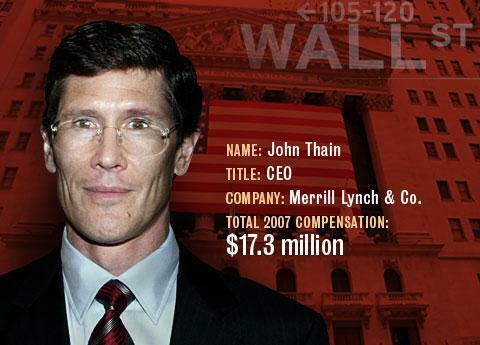 Thain joined Merrill Lynch as Chairman and CEO on December 1, 2007, just weeks before the end of the fiscal year. A $15 million bonus made up the bulk of his 2007 compensation. In addition, Thain drew a $57,692 salary and earned $902,966 in stock awards and $1.3 million in option awards. Merrill Lynch's fiscal year ended December 28, 2007. Former Merrill Lynch CEO Stanley O'Neal, who retired last October, received $24.3 million in total compensation during Merrill Lynch's 2007 fiscal year, which ended December 28. His compensation included a $584,231 salary; $22 million in stock awards; $809,217 in option awards; $308,361 due to changes in pension value and nonqualified deferred compensation earnings; and $593,691 in "other compensation." Whenever companies hit hard times and have layoffs, employees like to see their CEOs falling on their own swords. John Mack, Chairman and CEO of Morgan Stanley, did just that last year. According to a Morgan Stanley SEC filing, "Mr. Mack requested that he not receive a bonus for fiscal 2007 due to the company's fourth quarter results." Without a bonus, Mack made a comparatively paltry total compensation of $1.6 million in 2007. That includes a salary of $800,000, a pension contribution of $391,844, other compensation of $399,153 and stock options of $11,461. Mack not only gave up his bonus in 2007, he also didn't get any additional stock awards. But don't feel too sorry for Mack; he pocketed more than $40 million in stock and option grants in December 2006. Washington Mutual's former chief Kerry Killinger (who this month was replaced by Alan Fishman), earned a $1 million salary in 2007 along with $669,104 in stock awards and $3.2 million in option awards. Nearly $400,000 in "other compensation" brought his 2007 compensation total to $5.3 million. It's well under what he cost the company in 2006, when Killinger's total compensation topped $14 million. WaMu's fiscal year ended Dec. 31, 2007. 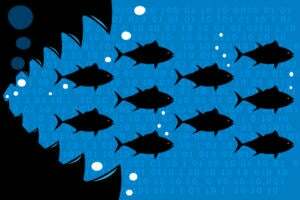 Fishman, meanwhile, is working to shore up confidence in the still independent but struggling WaMu as the fallout from other financial-services giants' meltdowns continues. These compensation figures are taken from the summary compensation tables included in public companies' 2007 proxy statements (DEF 14A form), as filed with the U.S. Securities and Exchange Commission. As such, the tallies represent essentially what each CEO cost his company in fiscal year 2007 -- not what the CEO pocketed. For example, while these numbers include stock awards and option awards, the figures in the compensation table represent the cost of these awards to the company in fiscal year 2007. That's less than face value, since the company (from a financial reporting perspective) accounts for the expense over the vesting period of the award. "You're seeing the charges of the previous awards that are vesting in that year and are being reflected in the financial statements of the company," explains Nora McCord, a consultant at Steven Hall & Partners , which specializes in executive compensation consulting. "So it's not [the full value of] what was awarded that year, it's kind of an amalgamation of what has been awarded and what is still vesting from previous years." We want to hear from YOU. Were these chiefs overpaid? Whose compensation is most troubling?